Have You Reached Email Account Overload? Is anyone else starting to lose track of how many email accounts they use? It used to be so much easier. A few years ago I had three main accounts: one for work, one for personal, and a webmail account for trash. I now have at least five separate primary accounts. Then there are another dozen or so accounts that forward to these. Finally, I’ve lost count of the number of webmail accounts I’ve registered. I used to consider these as ‘throwaway’ addresses, but they’ve become increasingly important. For example, anyone using Google systems such as Docs, Analytics, and AdWords, will almost certainly have a GMail account. I suspect this is an issue that’s primarily encountered by freelancers and small business owners. It’s common to develop micro-businesses selling software or services from a variety of websites. I’m also regularly asked by clients to become a technical contact for their online systems (or webmaster as it used to be known). However, I’m sure email overload is becoming a frustrating issue for mainstream users too. 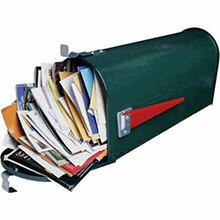 Applications such as Microsoft Outlook or Mozilla Thunderbird can help and I like to think I’m fairly organized. All my incoming emails are color-coded or forwarded to an appropriate folder. Spam is rarely a problem because it’s filtered on at least three levels. Finally, I like to empty my inbox and delete emails when a task has been completed. But problems remain — some webmail accounts must be checked manually and I still have too many emails for too many purposes! The easy answer would be to scrap some of these accounts, but it’s not that straight-forward. It’s often necessary to send emails from a particular address so multiple identities are required to portray a professional image and not confuse recipients. But is this a widespread problem and is a solution required? Many webmail services offer email aggregation facilities but few offer the configuration options of offline clients such as Outlook or Thunderbird. There’s also the risk that centralizing your email online creates a single point of failure and you succumb to the privacy, security and financial concerns of a third party. How many email accounts do you monitor? Are you suffering from email overload? Have you found a good solution? Or what steps did you take to rectify the problem?